This page is about the modern country named Germany. For other meanings of Germany, see German. The Federal Republic of Germany, also called Germany (German: Bundesrepublik Deutschland or just Deutschland), is a country in Central Europe. The country's full name is sometimes shortened to the FRG (or the BRD, in German). To the north of Germany are the North Sea, the Baltic Sea, and the country of Denmark. To the east of Germany are the countries of Poland and the Czech Republic. To the south of Germany are the countries of Austria and Switzerland. To the west of Germany are the countries of France, Luxembourg, Belgium, and the Netherlands. The total area of Germany is 137,847 square miles and has warm weather most of the year. In June 2013, Germany had a population of 80.6 million people. After the United States, Germany is the second most popular country for migration in the world. Before it was called Germany, it was called Germania. In the years A.D. 900 until 1806, Germany was part of the Holy Roman Empire. From 1949 to 1990, Germany was made up of two countries called the Federal Republic of Germany (inf. West Germany) and the German Democratic Republic (inf. East Germany). During this time, the capital city of Berlin was divided into a west and an east part. On 13 August 1961, East Germany started building the Berlin Wall between the two parts of Berlin. 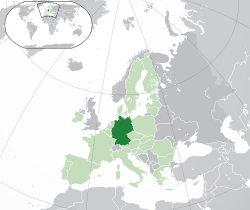 West Germany was one of the countries that started the European Union. The second Reich was started with a treaty in 1871 in Versailles. The biggest state in the new German Empire was Prussia. The Kings of Prussia were also "German Emperors", but they did not call themselves "Emperors of Germany". There were many other kingdoms, duchies and republics in the Empire, but not Austria. Germany stayed an empire for 50 years. The treaty of unification was made after Germany won the Franco-Prussian War with France in 1871. In World War I, Germany joined Austria-Hungary, and again declared war on France. The war became slow in the west and was fought in trenches. Many men were killed on both sides without winning or losing. In the Eastern Front the soldiers fought with the Russian Empire and won there after the Russians gave up. The war ended in 1918 because the Germans could not win in the west and gave up. Germany's emperor also had to give up his power. France took Alsace from Germany and Poland got the Danzig corridor. After a revolution, the Second Reich ended and the democratic Weimar Republic began. After the war, there were a lot of problems with money in Germany because of the Peace Treaty of Versailles (which made Germany pay for the costs of World War I) and the worldwide Great Depression. The Third Reich was Nazi Germany; it lasted 12 years, from 1933 to 1945. It started after Adolf Hitler became the head of government. On 23 March 1933, the Reichstag (parliament) passed the Enabling Act, which let Hitler's government command the country without help from the Reichstag and the presidency. This gave him total control of the country and the government. Hitler in effect became a dictator. Hitler wanted to unify all Germans in one state, and did this by annexing places where Germans lived, such as Austria and Czechoslovakia; Hitler also wanted the land in Poland that Germany had owned before 1918. Poland refused to give it to him. The invasion of Poland started World War II on 1 September 1939. In the beginning of the war, Germany was winning. It managed to take over much of Europe. However, Germany attacked the Soviet Union in 1941 and, after the Battle of Kursk, the German Eastern Front began a slow retreat until war's end. On 8 May 1945, Germany gave up after Berlin was captured, Hitler had killed himself a week earlier. Because of the war, Germany lost a lot of German land east of the Oder-Neiße line, and for 45 years, Germany was split into West Germany and East Germany. The head of state is the Bundespräsident (Federal President). This person has no real powers but can order elections for the Bundestag. The current president is Joachim Gauck (Independent). Germany also contains parts of Europe's longest rivers, such as the Rhine (which makes up a part of Germany's western border, while Oder is on its eastern border), the Danube and the Elbe. There are at least seven million people from other countries living in Germany. Some have political asylum, some are guest workers (Gastarbeiter), and some are their families. A lot of people from poor or dangerous countries go to Germany for safety. About three million Muslims live in Germany, 3.7% of the total population. The country also has a large atheist and agnostic population, and there are also Jain, Buddhist and Zoroastrian communities. The 20th century has also seen a neopagan revival. Germany has created a high level of gender equality, disability rights, and accepts homosexuality. Gay marriage is somewhat legal in Germany. Germany was rated the second most valuable country in the world, and a global poll showed that Germany has the most positive influence on the world. Football is the most popular sport in Germany. The national team has won the FIFA World Cup 4 times (1954, 1974, 1990 and 2014), and appears in the finals a lot. The team also has had the most Euro titles than any other country. The top football league in Germany is Bundesliga. Also, the German Football Association (Deutscher Fußball-Bund) is the largest in the world. Some of the world's best Footballers came from Germany. These would include Miroslav Klose, Oliver Kahn, Gerd Müller, Michael Ballack, Bastian Schweinsteiger, Franz Beckenbauer, and so on. Plus, many tournaments have taken place in Germany. The most recent was the 2006 FIFA World Cup, and the 2011 FIFA Women's World Cup. The Audi Cup takes place in Germany every year in Munich. ↑ "World Factbook". CIA. https://www.cia.gov/library/publications/the-world-factbook/geos/gm.html. Retrieved 26 March 2011. ↑ "Press releases - For the first time more than 16 million people with migration background in Germany". Federal Statistical Office (Destatis) - Destatis.de. 2010-07-14. https://www.destatis.de/EN/PressServices/Press/pr/2010/07/PE10_248_122.html. Retrieved 2012-11-04. ↑ "Pressemitteilungen - Ein Fünftel der Bevölkerung in Deutschland hatte 2010 einen Migrationshintergrund" (in (German)). Statistisches Bundesamt (Destatis) - Destatis.de. 2011-09-26. https://www.destatis.de/DE/PresseService/Presse/Pressemitteilungen/2011/09/PD11_355_122.html. Retrieved 2012-11-04. ↑ 6.0 6.1 Statistisches Bundesamt: Bevölkerung auf Grundlage des Zensus 2011. Retrieved 16 December 2013. ↑ 8.0 8.1 8.2 8.3 "Germany". International Monetary Fund. April 2013. http://www.imf.org/external/pubs/ft/weo/2013/01/weodata/weorept.aspx?pr.x=59&pr.y=9&sy=2012&ey=2012&scsm=1&ssd=1&sort=country&ds=.&br=1&c=134&s=NGDP_R%2CNGDP%2CNGDPD%2CNGDPRPC%2CNGDPPC%2CNGDPDPC%2CPPPGDP%2CPPPPC&grp=0&a=. Retrieved 17 April 2013. ↑ [url=http://hdr.undp.org/en/media/HDR_2013_CH.pdf "Human Development Report 2013"]. UN. 2013. url=http://hdr.undp.org/en/media/HDR_2013_CH.pdf. Retrieved 14 March 2013. ↑ "Germany Top Migration Land After U.S. in New OECD Ranking". Bloomberg. 20 May 2014. http://www.bloomberg.com/news/2014-05-20/immigration-boom-propels-germany-past-u-k-in-new-oecd-ranking.html. Retrieved 29 August 2014. ↑ "History of the European Union". European Union. http://europa.eu/abc/history/1945-1959/1957/index_en.htm.. Retrieved 20 March 2012. ↑ "The foundation of the first German emipre". http://laender-lexikon.com/fdtlhi1r.htm. Retrieved 20 March 2012. ↑ 14.0 14.1 14.2 "A timeline of German — The second German empire". http://www.stefanjacob.de/Geschichte/Unterseiten/Zeittafel.php?Intern=5&PHPSESSID=b90e60702ee906731aa362b243a99d20. Retrieved 20 March 2012. ↑ "A timeline of German — The Third Reich". http://www.stefanjacob.de/Geschichte/Unterseiten/Zeittafel.php?Intern=6&PHPSESSID=b90e60702ee906731aa362b243a99d20. Retrieved 20 March 2012. ↑ "History of Nazi Germany". http://www.123helpme.com/view.asp?id=22684. Retrieved 20 March 2012. ↑ "Adolf Hitler by britannica.com". http://www.britannica.com/EBchecked/topic/267992/Adolf-Hitler. Retrieved 20 March 2012. ↑ "This Day in History — History.com — What Happened Today in History". history.com. 2012 [last update]. http://www.history.com/this-day-in-history. Retrieved 20 March 2012. ↑ "List of Countries - European Union (EU)". statcan.gc.ca. 2012 [last update]. http://www.statcan.gc.ca/subjects-sujets/standard-norme/sgc-cgt/eu-ue-eng.htm. Retrieved 20 March 2012. ↑ "Grundgesetz für die Bundesrepublik Deutschland" (in German, English). The German Bundestag. 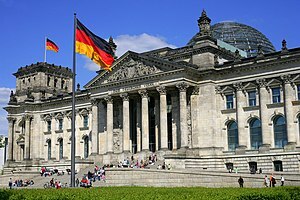 http://www.bundestag.de/parlament/funktion/gesetze/grundgesetz/gg_02.html. Retrieved 20 March 2012. "Artikel 20(1) Die Bundesrepublik Deutschland ist ein demokratischer und sozialer Bundesstaat." ↑ "Angela Merkel (chancellor of Germany) -- Britannica Online Encyclopedia". britannica.com. 2012 [last update]. http://www.britannica.com/EBchecked/topic/711465/Angela-Merkel. Retrieved 20 March 2012. ↑ "German Bundestag: Elections". bundestag.de. 2012 [last update]. http://www.bundestag.de/htdocs_e/bundestag/elections/index.jsp. Retrieved 20 March 2012. ↑ 23.0 23.1 23.2 23.3 23.4 23.5 Hesp, Patrick; McKnight, Tom; Thom, Bruce; Wonders, William (2008). Geographica's World Reference. Random House Australia. pp. 446. ISBN 0091841194 . ↑ "Bevölkerungszahlen 2011 und 2012 nach Bundesländern" (in German). Statistisches Bundesamt. August 2013. https://www.destatis.de/DE/PresseService/Presse/Pressemitteilungen/2013/08/PD13_283_12411.html. Retrieved 16 December 2013. ↑ Hesp, Patrick; McKnight, Tom; Thom, Bruce; Wonders, William (2008). Geographica's Worl Reference. Random House Australia. pp. 451. ISBN 0091841194 . ↑ "Germany Economy | Economy Watch". economywatch.com. 2012 [last update]. http://www.economywatch.com/world_economy/germany/. Retrieved 20 March 2012. ↑ "Germany". state.gov. 2012 [last update]. http://www.state.gov/r/pa/ei/bgn/3997.htm. Retrieved 20 March 2012. ↑ "Companies in Germany". mapsofworld.com. 2012 [last update]. http://www.mapsofworld.com/germany/german-companies.html. Retrieved 20 March 2012. ↑ 29.0 29.1 "CIA Factbook: Germany". https://www.cia.gov/library/publications/the-world-factbook/geos/gm.html. Retrieved 2009-09-01. ↑ "Ilaam.net". http://www.ilaam.net/Intl/PopStats.html. Retrieved 2009-05-18. This page was last changed on 25 November 2014, at 00:44.